This pink polo with palm tree prints is totally in the summer theme! Do not hesitate! 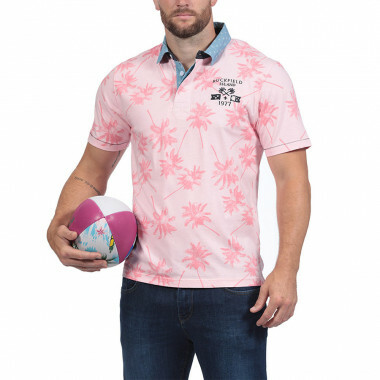 The Ruckfield palm print short-sleeved polo is a must-have during the summer months. Pink color, straight cut. Spiked collar, short sleeves. Embroidery and Coats on the chest and number 8 in the back. The double button placket, the collar and the lapel of the collar are made of a modern print and different fabrics. It was in 2007 that Sebastien Chabal, fierce and legendary player of French rugby, dreaded all the way to New Zealand, embarks on the adventure to create Ruckfield in 2009. Surrounded by people as passionate about rugby as him, he is forming a united team with him and sharing the values of their favourite sport: team spirit, respect, friendliness or solidarity to name a few. Sébastien Chabal presents his brand as follows: "Ruckfield represents all the codes and values of rugby, be it elegance, hardness, sharing, conviviality ... I believe that when we embarked on this adventure, we was really where we wanted to go, and today we are on this path, there are still many beautiful things to do. "